The United States Postal service announced price hikes for mailing services today, including a 2-cent increase in the price of a First-Class Mail stamp. Those stamps will be 44 cents with the price increase. Stamps will be 44 cents starting on May 11. The changes will go into effect on May 11, which is in line with the annual review of postal mailing prices that are adjusted each may. 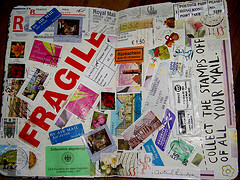 The Postal Service estimates that this will cost the average household approximately $3 more per year for postage. In the statement released today, they made no estimation for how much this might effect small business or enterprise-level customers of the Postal Service. Those wishing to get past the price increase may purchase Forever Stamps between now and May 10, which will be the same price as current First Class stamps, but will be usable when the price increase goes into effect on May 11. The USPS will likely issue 2 cent stamps for those with extra 42-cent stamps, as the Forever Stamps may not be that economical after all. The Postal Service did not announce any additional mailing price increases today, but did note that the 17-cent additional ounce price for First Class Mail will remain in place, unchanged. Last month, the USPS announced shipping fee increases, as we reported here. If you bought Forever Stamps at 39 cents and now the rate for postage is 44 cents you would be saving 5 cents every time you used a stamp. That would seem to be an economical plus. Am I missing something? Does anybody know how to email Stephen Kearney (to express an opinion)? Even if you bought stamps for cheaper and used them at a time after stamp prices went up, they would send your mail back to you and put a note on the envelope telling you it is short the exact postage amount. I have had this happen before and am pretty sure that’s how it works now. What the article failed to say is how this is a disaster for average people doing online sales and probably companies online as well. People selling stuff like seeds or small hardware will be wiped out. I once sold only political pins. Man, am I glad I switched to something else. Why is this a complete disaster for many? They First Class rates on the upper scale of weight have not just gone up. They have skyrocketed. Today I listed a product of 15 oz. weight and was shocked to see the shipping cost was $6.65 for First class. Shockingly, the price for Priority was exactly the same!! Before today, First Class for 15 oz. small packages was slightly more than $4. So what we’re talking about here is over a 50% increase in cost. That’s outrageous. They want you to ship everything Priority now. I have two online stores and thousands in inventory and now must go through both stores with a comb and do edits to reflect the change. Actually, it will force me to eliminate inventory because the shipping cost will eliminate the profit on my lower-priced items that I’m only looking to make $1.50 to $2. In one stroke the USPS destroyed a small percentage of my inventory. And they made work for me and that time is worth money, too. People will say, well, jack up your prices. But if I do, people won’t buy the product! I can’t stay competitive with the big sellers who get bulk discounts. People won’t want to buy a common political pin for $9.65 (including shipping). This disastrous change will destroy people selling low-cost political items. Man, am I glad I switched to books. At least for now, the bastards are leaving Media Mail alone. At least the last time I checked..